It allows the separation by solid mixtures of a similary particules. One of the component it must be soluble in liquid. 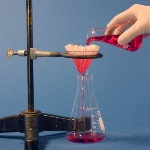 A separating funnel allows the liquid components of the heterogeneous mixtures. And it can have different densities to be separated. Is based to a different densities, allows the components to be separated. It allow the mixture to stand the solid and liquid componets separate. 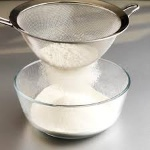 Allows mixtures of solid to different to be separated. It's passed to a sieve. It allows mixtures of a similary sizes of density of solids mixtures. One of the two components must have the density lower than the water. It separates a suspension or a liquid acording to their density. To a heterogeneous mixture to a solid, this method allows the components with magnetics properties to be separated than the rest. Allows different types of liquids to be separated. The mixture it stays with a lower boiling point evaporated. The gas is collected and it condensed in another container. It allows the components to be separated to the absorbent surface as a pice of paper. Is used to separate solutions solids in a liquid solvennt. The liquid is vaporized and the solid deposited at the bottom of the container.